PASSAGES FROM THE FRENCH AND ITALIAN NOTEBOOKS. Boston,: James R. Osgood and Company, 1872. Two volumes. First American Edition. Clark A28.2A, B.A.L.7636. 8vo,, original green cloth. This book turns up, but fine copies are not the rule and this copy is an uncommonly fine bright copy. "When "The Marble Faun" was first published, it attracted American readers, at least, almost as much by its descriptions of Roman ruins and Italian landscape by the delicate and imaginative touch with which it reproduced or gave new meaning to famous works of antique and Renaissance art, as by the weird fascination of its plot and psychological problems. How the author was enabled to impart this additional charm to his work is explained by a perusal of his "French and Italian Note-Books." There the daily experience of his Italian sojourn, and the mute life of painting and sculpture as it stood to be reviewed by his eye, are set down precisely as they presented themselves to him at the time. Of France he saw but little, and the main portion of these journals is therefore devoted to Italy, where he remained from the end of January, 1858, until the middle of May, 1859." - George Parsons Lathrop. 1871. [the leaves still unopened] [In Two Volumes.] London: Strahan & Co., 1871. 4 pp undated Vol I terminal ads; ad slip tipped onto Vol I and Vol II front free endpapers, advertising works by George MacDonald and Robert Buchanan respectively. Original royal blue cloth decorated in black and gilt. First Edition (English), published about four months before the American edition (which is dated 1872). After Nathaniel Hawthorne's death, his widow Sophia had passages from his notebooks published -- first from THE AMERICAN NOTE-BOOKS in 1868, then from THE ENGLISH NOTE-BOOKS in 1870, and finally this title.~This set is in the primary binding (Clark's "A"), with bands of gilt and black on the front cover and spine, and with the publisher's anchor device on the spine. Both volumes are unusually bright and near-fine (trifling wear at the top of one joint, original chocolate brown endpapers archivally mended at the gutters); almost 150 years after publication the leaves remain unopened. Clark A28.1. Housed in a morocco-backed slipcase with inner chemise (which today would cost about as much as these volumes' price to create!). London: Strahan & Co, Publishers, 1871. Two volumes. 8vo. 200 x 133 mm. ( 7 3/4 x 5 1/4 inches). [iv], 371 pp. ; [iv], 368 pp., plus 4 pp. ads. Original blue publisher's cloth, title in gilt on spine; heads and tails a bit worn, text block a bit shaken. First edition. "A series of journal entries made between January 1858 and June 1859 for the most part, although some entries are as late as 1862. Most of them are observations on Italy, where he was between January 1858 and May 1859. Not intended for publication, his wife transcribed them in the winter of 1870-71, just before his death. An edition was published by Osgood in Boston in 1872. (282 MNS). PASSAGES FROM THE FRENCH AND ITALIAN NOTE-BOOKS(2 VOLS. ), PASSAGES FROM THE ENGLISH NOTE-BOOKS( 2 VOLS. ), PASSAGES FROM THE AMERICAN NOTE-BOOKS(2 VOLS.). Hawthorne, Nathaniel ( Set of 6 Volumes). Cambridge: Houghton Mifflin - Riverside Press, 1896. . 1896-1899 - 6 VOLUMES. PRESUMED COMPLETE SET OF HAWTHORNE'S PASSAGES.Copyright, originally by Charles Osgood & Co. 1871, Rose Hawthorne Lathrop 1899.Printed by H.O. Houghton Miflin & Co Riverside Press.Engraving on title page as well as engraved header on page 1 of each volume.Olive brown cloth boards with gilt titles on spines.Gilt on top edge.A PRETTY LITTLE SET. Size: 16mo. Hardcover. Fine. London: Strahan & Co., Publishers, 1871. First English Edition. 371;371pp. 2 vols. 8vo. Bound by STIKEMAN & CO. in three quarter blue morocco, richly gilt spines, raised bands, t.e.g., with original purple cloth binding bound in at back. From the library of Agnes Neustadt, with her bookplate. About fine, minor rubbing. First English Edition. 371;371pp. 2 vols. 8vo. 2007-05-23. Good. Ships with Tracking Number! INTERNATIONAL WORLDWIDE Shipping available. May not contain Access Codes or Supplements. May be ex-library. Shipping & Handling by region. Buy with confidence, excellent customer service! 2011-10-24. New. Ships with Tracking Number! INTERNATIONAL WORLDWIDE Shipping available. Buy with confidence, excellent customer service! 2007-07-06. Good. Ships with Tracking Number! INTERNATIONAL WORLDWIDE Shipping available. May not contain Access Codes or Supplements. May be ex-library. Shipping & Handling by region. Buy with confidence, excellent customer service! Houghton Mifflin Company / The Riverside Press Cambidge, 1871. This is an Unusual Hawthorne offering for the collector.. 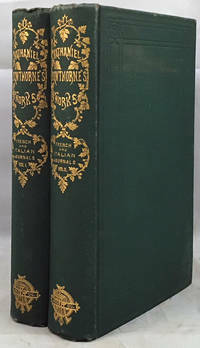 This is a Two Volume set in Leather in Fair condition.c1871 by James R. Osgood.. It is 4 1/2" by 6" dimentions. I guess a traveling edition. These books have a burgandy leather (Flexible) binding with gilt lettering on the spine. The page ends are all gilt. In Vol. 1 there is wear to the edges and some wear to the cover. In Vol. 2 there is alos wear to the edges, and the leather is now brown from wear or sunning.I The spine ends show cracking but the lettering is still bright.. In both Vol. I & Vol.2 the inside spine has separated brom the block. The pages are all clean & bright and solid. Unusual Set!!. Hardcover. Fair/No Jacket Issued. 2008-08-25. New. Ships with Tracking Number! INTERNATIONAL WORLDWIDE Shipping available. Buy with confidence, excellent customer service! 2008-08-25. Good. Ships with Tracking Number! INTERNATIONAL WORLDWIDE Shipping available. May not contain Access Codes or Supplements. May be ex-library. Shipping & Handling by region. Buy with confidence, excellent customer service! Watson Press, 2007-03-15. Paperback. Used:Good. Watson Press, 2007-03-15. Paperback. Good. Boston: Houghton, Mifflin and Company, 1889. Very Good. Riverside Edition, Volume ten (of twelve) only. The Complete Works of Nathaniel Hawthorne, with introductory notes by George Parsons Lathrop and illustrated with etchings by Blum, Church, Dielman, Gifford, Shirlaw, and Turner. Pebbled brown cloth, gilt-stamped leather spine label, top edge gilt. Gutter cracked, extremities lightly rubbed, corners bumped, a very good copy with a laid in handwritten letter on State University of Iowa letterhead addressed to poet and educator Daniel G. Hoffman. Dodo Press, 2007-07-06. Paperback. Used:Good. Bibliobazaar This is ta Classic reproduction hardback edition of this title by Bibliobazaar. The condition is Near Fine, no jacket. no date.This larger laminated book has a very bright and very clean cover. The edges are very nice with a few tiny bottom edge nicks. The pages are tight, bright, and unmarked, no hilighting.no names. 459 pages.. Hardcover. Near Fine/No Jacket Issued. Boston, MA: Houghton, Mifflin and Company. Very Good with no dust jacket. 1881. Firtd. Hardcover. Book only lightly used and shows minimal wear to cover and binding. Minor shelf wear along bottom. ; Sewn binding. Cloth over boards. Book has appearance of light use with no easily noticeable wear. Book looks to be in good shape for its age and use. ; Volume I; Vol. 1; 8vo 8" - 9" tall; 269 pages; Hawthorne, who, like Edgar Allan Poe, took a dark view of human nature, was a central figure in the American Renaissance. His best-known works include The Scarlet Letter and The House of the Seven Gables. After his death his wife edited and published his notebooks Passages from the American Notebooks, Passages from the English Notebooks, and Passages from the French and Italian Notebooks . Watson Press. Used - Like New. Used - Like New. Book is new and unread but may have minor shelf wear. Ships from UK in 48 hours or less (usually same day). Your purchase helps support the African Children's Educational Trust (A-CET). 100% money back guarantee. We are a world class secondhand bookstore based in Hertfordshire, United Kingdom and specialize in high quality textbooks across an enormous variety of subjects. We aim to provide a vast range of textbooks, rare and collectible books at a great price. Through our work with A-CET we have helped give hundreds of young people in Africa the vital chance to get an education. We provide a 100% money back guarantee and are dedicated to providing our customers with the highest standards of service in the bookselling industry. Muller Press, 2008-08-25. Paperback. Used:Good. Muller Press, 2008-08-25. Paperback. Good. Boston: Houghton Mifflin, 1913. Burgundy hardback with gold print on spine. Minor fraying/bumping to edges and corners of boards. Pages tight but book will lay open; a very slight split between pages 240 and 241 showing. Pages unmarked but some with "reading" dirtiness/wear. 574 pages. Copyright date stated as 1913, no other print info for this edition stated. This book is Volume X from the series "The Complete Works of Nathaniel Hawthorne, with introductiory notes by George Parsons Lathrop in Thirteen Volumes.". Hard Cover. Very Good/No Jacket. 8vo - over 7¾" - 9¾" Tall. Boston: Houghton Mifflin, 1899. Nick in spine top.. Later Printing. Original Cloth. Very Good. Dodo Press. PAPERBACK. 1406543853 Special order direct from the distributor . New. Houghton, Mifflin and Company. Used - Acceptable. Shows definite wear, and perhaps considerable marking on inside. Boston: Houghton Mifflin. Good with no dust jacket; Pages 195-218 Are Loose, Spine Cover Showing Wear. 1879. Hardback. 260 pages . PASSAGES FROM THE FRENCH AND ITALIAN NOTE-BOOKS - VOL. I.
Boston: Houghton, Mifflin and Company. Good with no dust jacket. 1871. Hardcover. Ex-Library; Vol. 1; 270 pages . Boston: Houghton, Mifflin and Company. Good with no dust jacket. 1871. Hardcover. Ex-Library; Vol. 2; 269 pages .